New year, new thread (SWIDT?). Thanks all! This derby is Portmanteau’s – the fusing of two words. I got three entries in. Hope you like them – these were fun for me to make. @ACraigL All three are excellent! I can tell by the placement I’m not the only one who thinks that. @mehbee Thanks! I’m excited, but the derby is still early on. Fingers crossed, though! Bought today’s, which is great! Wish they had a tote design for it. I’ve got one up for the week–thanks! @kevlar51 @f00l needs this made. Forgot to mention, Tenionaire printed in a side sale on Monday! Unfortunately, I’m in the too-many-shirt-offerings-during-overall-low-shirt-sales window, and have only sold 3. Ironically, this doesn’t even qualify me as a “tenionaire”. @ACraigL Ooh, editor’s choice. Why hasn’t the editor bought one? @sammydog01 One of life’s mysteries, I suppose. @mehbee Rock on! Thanks and happy new year!! @sammydog01 heh very good point sammydog!! I do wonder if the Editor’s Choice dailies are under a B-contract or F-contract. If it’s the latter, it might be why there were several more printed from the Circle derby; no $1000 up front. @narfcake I was wondering the same thing. Did they run out of daily subs or something? It’s not like the ones they picked are setting any sales records – even today’s EP? I mean, I just don’t get it. There are many others in the side sale that have more appeal (IMO) that that one. @narfcake oy. And they wanted both my designs that derby, I only gave them the one… and been turning down since then. @narfcake You mean maybe the other one (or ones, I’m losing track of entries/derbies) was deemed for the woot-off? They didn’t say if it was, that would of at least been something! Reaallly hoping to place this time! It’s been so long! and I have no way of knowing myself – but there were several designs from the circle derby that ended up printing in the the shirt.woot-off and then a few more as ECs. I’ll vote for it, but I won’t give woot my money. @Pantheist If enough people vote for it, I get to take theirs. @ACraigL I mean, only in the same way an employee would get to. Still, someone is going to do it so I don’t see why it shouldn’t be you- especially since I do like the shirt. Thanks @narfcake to pointing me to the new thread! @jasneko I really do like this one. @jasneko You’re already up to 18 votes, right there in it! Good luck!! @narfcake Poor kitties and evil humans!! @jasneko It doesn’t seem to bother/taunt them any more than a laser pointer, so. But not the helium balloons/any eaten balloons. @jasneko Yeah, no joke on that. We have a balloon law here in California, but it remains a point-of-sale procedure on mylar only, not latex or a ban on any of it. @jasneko It’s still all too common that it’s “out of sight, out of mind”. Um, hello?? printed in the side sale today, woo! One more request to anyone who didn’t vote! (Can you tell how long it’s been since I’ve placed? Sorry to post twice!! )… 2 more hours left. Thanks very much everyone! @jasneko Fingers crossed for you. @jasneko hoping it’s me and you all the way! I have 3 in the fog, but don’t have any real expectations either way – I’m pretty sure procrasticise is on the lower end anyway – but should be an interesting result tomorrow. @jasneko So you didn’t appear in the side sale – I’m assuming that was again your choice. I’m actually curious on how you do that – do you not send artwork? Or do you send it with a instruction “only if I win”? I haven’t been sending in the artwork 1)because often getting it print ready can be very time consuming (and then pointless if it’s not printing) and 2)I kind of feel like then the choice to print is out of my hands. Each time they put the emphatic instructions on sending in the artwork I feel like it’s directed at me! @kevlar51 @heartny @narfcake Thanks guys! Nice surprise this morning. Also, the comments are ridiculous. I’m loving it! @narfcake All part of my master plan to get @matthew to wear one of my designs in a video. I guess this one has the best shot? @ACraigL Mighty congrats on first place!! @snapster Feel free Please add to the discussion outrage there. And then maybe here. Suggestions: Chemtrails! Weather ballons! Crop circles! @narfcake there on Woot? That seems too intrusive. It’s nice, having trademarked both Woot and Meh to know the ins-and-outs of having a descriptor as your trademark. Mostly sad that the derby mechanism itself isn’t known well enough to completely explain why this was up for sale. @snapster Non-serious outrage is not intrusive. As for folks that don’t understand the derby, that’s been for years and years. I have scripted responses and cat pics for the inevitable “I hate this” posts. @snapster Made my day, thanks for the shout out! And second place too, @ACraigL! Actually … who’s ACriagL? Do you know that guy, @therealjrn? @narfcake Is that a typo or an imposter? @narfcake Cool. Fixable, I hope. @heartny Totally. I can’t, though; I don’t have that much power. @narfcake Thanks! I do hope that they fix that soon. That error costs me visibility into my catalog, as well as a launch notification (and probably payment, for all I know). Good weekend though! @ACraigL I can only imagine what the magical month of February will bring for you! At least it’s a short month. @narfcake Can you poke again on the name fix? I know it’s still early there, but I’d like to see it addressed sooner than later, if possible. I’m not fixing your broken Mr. Shruggie here, though. @narfcake Ha! All the characters are there, it just won’t render properly for some reason. And I was too lazy to use/find the mehdown version. @ACraigL a dude named Ben? Those guys are good. @ACraigL You mean the mehdown version “/shrug”? @snapster Did you get your mehvolution shirt yet? Mine arrived today and I got a few pictures of friends wearing it striking the shrug pose. Fun! @narfcake I’m extremely sad I missed that shirt. @narfcake Somehow I missed this until now. Thanks! Somehow I feel like the yellow is over-saturated. I’m not sure why there isn’t a more gradual fade out of the burst. It’s already half-toned that way (see comp at top of the thread), but otherwise I’m happy with the print. Related, Nonversation jumped to #9 in the top-20, and Mehvolution found its way out of the bottom rungs to #18. Looks like both will live on for another week. VIVA LA MEHVOLUTION! @ACraigL Yeah, I noticed that too. The colors are still muted well enough to work, though, so no complaints from me. 3 awesome entries in that portmanteau derby @ACraigL Could very well do 1st, 2nd, 3rd! 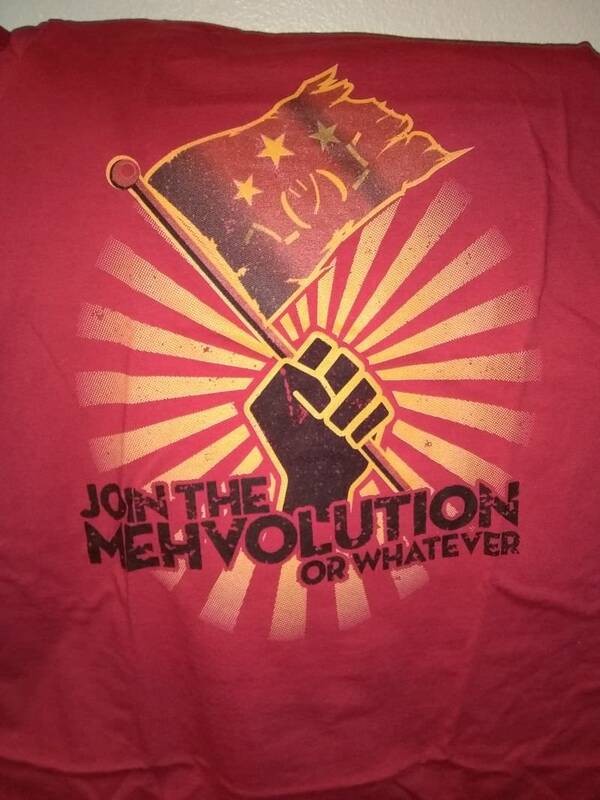 The sprawl of mentions for the Mehvolution shirt makes me wonder about using Mediocritee forums for shirt discussion threads. Would be a lot more elbow room to focus on different sites/designs/artists. Seems like we’d need visibility / reminders of it here? @snapster I would suggest, like, having t-shirts catshirts for sale. Seems like that would be a good fit. At the end of the day, the mentions, while super-fun for me, were a byproduct of this community reacting to the “meh” variant of the shirt, as seen similarly here , and less about general shirt interests. Obviously I like the idea of a dedicated space to discuss shirty things but I’m not sure it’s right time. That forum needs content (specifically, meh shirts) to drive interest and activity there. Without it, it will never get the eyeballs needed to serve the purpose of this thread – which is to shamelessly promote our derby entries. That forum needs content (specifically, cat shirts) to drive interest and activity there. @ACraigL FTFY. There’s only so many variations of a meh logo/general expression before the market dries up. Given the lack of request for more community input, I think the “still waiting” part of the poll is the outcome. @narfcake I mehnt meh produced shirts, not just literal “meh” designs, if that wasn’t clear, but I agree with your assessment either way. In other news, in the woot thread, introverts are starting to offend each other on the definition of introvert. Yay! @ACraigL No need to bring out the cat pics just yet, though. @narfcake Lol. The last (fe)line of defense. @narfcake shot you a PM over at woot – just seeking some feedback. Thanks! @ACraigL if you moved this thread to Mediocritee we would all forget to vote and that’s what it’s here for, right? @sammydog01 Yep. Even when Mediocritee gets actual shirts, not sure how kosher it will be to promote shirtwoot over there. At least here it’s not competey. The Sports Fandom derby has launched! Here’s my two entries. Thanks for any help, appreciated as always! And thanks to @narfcake for the feedback on Gridiron Ale. @kevlar51 Thanks Kev! I was wondering where everyone got to. I don’t link a lot of folks are feeling the sports derby (and many didn’t stick to the rules, unfortunately). @ACraigL It might be the most “non-wooter” themes I’ve seen. Legitimate sports shirts never fared well with the classic woot crowd, and I can’t say whatever crowd they’re attracting now is a big fan either. @kevlar51 That was my reaction too. I tried to keep to “generic” designs that could go either way, but keeping the sarcasm/snark out of it was definitely a challenge. @ACraigL Done, and what’s wrong with snark!!! @mehbee Normally nothing. I embrace it. This derby had specific rules around non-jokey shirts and something only mega sports fans would wear. But I should have gone in a traditional direction like others did, because straight-up sports shirts generally don’t do well with that audience. Gridiron Ale is still in the fog! One more voting day left… fingers crossed! @ACraigL Voted although it’s not like you seem to need my help these days. @sammydog01 NOT TRUE! Every vote helps. I had a good weekend 2 derbies ago, sure, but wins are usually far between. I appreciate the support (as well as the vote of confidence). I have a potentially controversial design ready for tomorrow. I think it’s funny, but we’ll see. Gridiron Ale got an Editor’s Choice today. Woo! Coincidental colors make it look like an endorsement for the Pats. I blame myself for that. Valentine’s Derby is up! Two entries this time, and thanks as always for any support. Some are loosely translated as there aren’t really Latin words for them, but my daughter, 4th year Latin student and medalist, assures me they’re grammatically correct. Looks like this isn’t my derby. Thanks for the votes though… maybe one of these will see an HM next week. Sat the last one out but have two in this one - thanks for any help! @jasneko Second one is very clever! Gotcha on both. Got one up in the “Civility” Derby–thanks for any help! @kevlar51 I really want this to print. Voted! Just submitted this. Thanks for any votes! @jasneko @kevlar51 Got you both. Just submitted one more - another revamped from many years ago! Thanks again everyone! Social Confections printed today in a side sale! Missed last week, so I over-indexed for this one. This is the “P” derby. Thanks for any help! 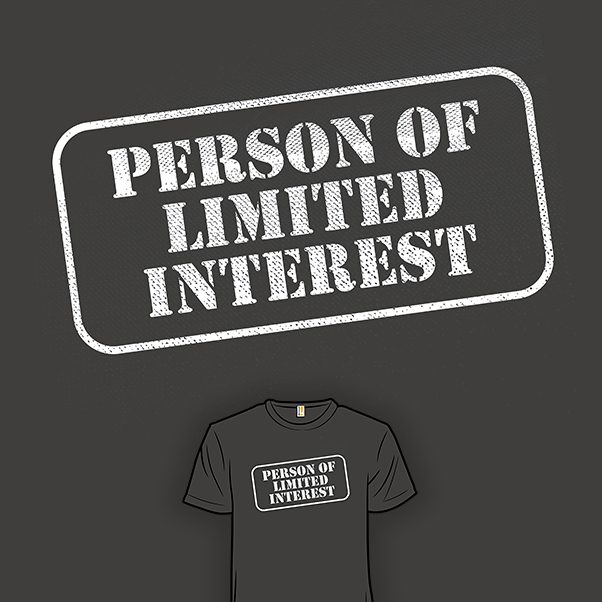 @ACraigL I like person of limited interest a lot. But the dinosaur one looks familiar- are you sure there isn’t one like it already? @sammydog01 Kinda. I originally created this one as a daily. It was not accepted so I subbed it to a “Maroon Shirt” derby changing the colors around to make it work. That didn’t print either, so I’m trying one more time with the original palette and blank color. @ACraigL So I saw it here. I’m not crazy after all. Well, maybe a little. @sammydog01 No more than the rest of us. Hey y’all, trying this design again - thanks for any votes! @jasneko I love the mouse and I love the shirt color. @sammydog01 Thank you! Me too - I love the lemon yellow color, and not enough shirts like that! It’s interesting though because I feel like lemon is rarely seen in the derbies/shirts but there are actually 3 in the fog right now (not that you should vote for those also ). Unusual! Here’s my two for the St. Patrick’s Day derby! Thanks for any help! @kevlar51 Same. Awesome design Kevlar! @ACraigL those are both great. Here’s my entry for the derby–thanks for any help! @therealjrn It does look like a pill. @kevlar51 Congrats on the 3-spot. Definitely picking one up tomorrow! Just submitted this … thanks for any help! @therealjrn The neko in @jasneko is cat. @sammydog01 yay so glad! I black cats and they need more good press! Woot asked that I place the female version separately, so please vote for this one as well. Thank you!! @ACraigL I’m blaming you that your .sig is broken now. @acraigl Congrats on the artist spotlight!! @ACraigL So awesome, must have been a great feeling!! They’ve didn’t give you any headsup on it? @jasneko Nope. I woke up like this. @ACraigL That’s great! Congrats again! @jasneko They seem to be doing more lately… hopefully youll get your turn soon! 2 designs in the new derby if you would like to vote - thanks! @jasneko Done. The lotus is brilliant, and I would wear it with pride. @jasneko Got em. You do so well with both cute and beautiful. @jasneko Psst. Post when you get a print. I didn’t login via Amazon, so my copy is getting shipped the usual slow way. The shirtgoat gets the blame here, though, not @ACraigL. @ACraigL @jasneko @narfcake There’s a new production facility mentioned over on Woot. Have you heard anything about it? @ACraigL @jasneko @therealjrn There were job postings several months back, but that’s all I know. @jasneko @narfcake @therealjrn I’m aware this was happening, but can’t help with a progress update. I do recall the positions were mostly operations focused (i.e. press operator, management of those functions, and logistics). Nothing that screamed creative, nor anything I saw that would convince me to leave my current employer. Here’s 3 open jobs for that facility. Side note: There are NO open jobs on the woot site. Only Amazon. @ACraigL @narfcake @therealjrn I had no idea until now… whoa. Yay for the artist spotlight, @jasneko! FWIW, this is only the second side sale in which I have every design offered already. @jasneko @narfcake Came to say the same! Congrats!! @narfcake Ha wow, that is awesome! And amazing. @narfcake That looks great - thanks for the reminder, still have to order some! @jasneko how’s the sale going? Mine did pretty well. I think so anyway. Hard to tell without any artist dashboard or anything, grumble. Saw great tweet on on of my designs. Smile-fest. @ACraigL Cool! Seeing people in your own design is the best feeling! I completely forgot about the entering the derby yesterday Anyway, I entered today, please vote if you like it! @jasneko I love the dragon! @sammydog01 Thanks Sammy! I particularly like the way the dragon turned out too. I have 2 in this derby. Thanks for any help! PS. One more day left in my Artist Spotlight if anyone wants to pick up one of these designs on sale! @jasneko How’s the sale going? @ACraigL From what I can tell (it’s kind of tedious to figure out the way it is now), some shirts are moving along nicely! Others not as much. But definitely better than usual! @jasneko I regret that I have been of little help, what with having at least one of each already. @heartny That’s not one of @jasneko’s designs. @narfcake I guess cats and meh are a thing. @narfcake So they DQs patricspens’ design because it was too similar to @jasneko’s, but kept Walmazan’s in despite the above similarity? I know you called it out, but I would like to see a little more consistency there. @ACraigL @jasneko The thing is I didn’t even report Patrick’s. @ACraigL @jasneko @narfcake as far as I know, the tattle button sends messages to an empty hole in the ground. @jasneko @kevlar51 @narfcake I definitely find a higher correlation when comments are made rather than tattles – but then again I don’t know if anyone else even uses that feature. I feel like shirt (specifically Ochopika) is paying more attention to derbies lately, as seen in the early DQs this round. @jasneko @narfcake I bought that in a tshirt for my best friend! @mehbee @narfcake Hey awesome! Which one? Black cats are the new good luck? @mehbee @narfcake Nice! Hope your best friend likes it!! Thanks for any help on my entry this week! @kevlar51 I like it! Nice work. @kevlar51 @narfcake Narf beat me to it. Congrats in advance! @ACraigL @kevlar51 It’s akin to the mini-derbies in which the results were revealed before they were sold. My entry (so far, we’ll see if I finish what else I’m working on)… thanks for any votes! Ok I liked the way this looked so much I went in a different direction than I first intended… another one, please vote - thank you! @jasneko gotcha–don’t forget to vote for yourself! @kevlar51 Ha, good point - thanks! @jasneko Another pretty colored shirt! @sammydog01 Thank you! I really want this one to wear ! “Groovy” printed on the side sale today. Woo! @jasneko Yeah, figured it would get overwhelming. @UncleVinny That little fox in the forest illustration is really lovely! @Jasneko i looooove it so much! 2 new designs in the Joke derby - thanks for any votes! @jasneko Got them. Love the puppy. @sammydog01 @mehbee @ACraigL Much thanks! And anyone else - the alligator/crocodile one is still in the fog so please vote! Yay for 2nd place, @jasneko! @jasneko congrats on the print! First time I’ve drawn these particular reptiles for a derby… are crocodilians the secret to success? @jasneko I have a feeling it’s the joke but the alligators are cute too. @sammydog01 Heh yes I was just kidding, I’m sure it’s the joke! What’s funny is my dad didn’t get the joke … I sent it to him and he replied "Nice … But I JUST DON’T Get it!!! - WHY?? " Guess he’s not that familiar with the phrases!! @jasneko And it’s such a dad joke too. The new derby, Joke’s on You is up! Here’s my silly entries. Thanks for checking them out. Hope you think they’re as funny as I do. @ACraigL you deserve to win it all with that anti-gravity shirt! @UncleVinny I gotta admit, I do like 0mg line probably too much. But I think my favorite is the 8-ball. Thanks! @ACraigL Voted. I have to admit, this is my favorite derby in awhile. I want to put in for your contest on the other thread but I’m not exactly sure how to enter. @ACraigL @mehbee I think you just have to make a post you think ACraigL might think is funny! @mehbee @UncleVinny is right. Just post whatever you want. I’m going to pick 3 or 4 random names, so it really doesn’t matter what you put in there. Good luck, and thanks for the votes! Last day to vote! And thanks to those that did already! @ACraigL Got them. I liked the 8 ball one the best too. I’ve got one up for the Gears derby–thanks for any help! @kevlar51 Gotcha Kev. Good luck! @narfcake Wow you got 3!!! @jasneko One to wear, one oversized for sleep shirt duty, and one as a spare when the one to wear is in the wash.
Anti-Gravity: A Novel printed today in the side sale. Woo! Unfortunately, none of the other three did, even one finishing in the fog. I have 2 shirts up in the Dog derby! Please check them out, and thanks for any votes! @ACraigL I really like Truth. @ACraigL The first one looks really great! Had them done but didn’t get a chance to enter them until late - d’oh! Thanks for any help! @jasneko Got them! The first one is so true. @ACraigL Oops… didn’t read the rules at all! Darn. Took it down - thanks. @sammydog01 Thanks! Alas didn’t realize there was a “no cats” rule, so I took it down. @jasneko The first one featured a Dog 2.0. @jasneko patrickspens has a pretty similar shirt to one of yours in the derby (in the fog). I commented on it, but wanted to make sure you knew. @ACraigL That shirt looks incredibly familiar. Looks like one of yours is in the fog. Good luck! @sammydog01 Thanks! Yes, hoping it performs as well as Inevitability. @ACraigL I don’t know if it’s because his keyboard isn’t functioning again, but at least for me, @jasneko’s shirt is on the first page of results when searching “tail chasing Portal”. @jasneko @narfcake I think woot’s keyboards are broken as well – not sure how they can ignore that for this long and not pay attention to their own derby (and rules)? There’s several entries that contain cats and they’re still running as well, though not in the fog. @ACraigL Garfield is totally a cat. @ACraigL @jasneko The rejectionator has a tendency to take off days that end in ‘y’. I am one of only 6 people that voted for this shirt and I don’t see why no one likes it. Any thoughts? Am I missing something? @jasneko @narfcake @sammydog01 Not sure. It’s certainly cute enough. If I had to guess it’s because it was a late sub (Saturday, for a Thursday launch), and a pretty new artist so not known enough to generate a lift. The thumbnail choice isn’t great – I would have zoomed in a bit – but more likely the two previous points I mentioned. @ACraigL And not even one cat. Or a Garfield. /8ball Is Garfield a cat? @ACraigL @narfcake @sammydog01 I think that dog pile is really well-done and adorable!! Probably what Acraigl said. And it’s so easy to get overlooked in the derby. @ACraigL @sammydog01 Yeesh, the /8ball doesn’t even want to give an answer! @jasneko @narfcake There you go!